Re-cycling might be the buzzword the world over now, but residents of Dubai are only recently waking up to the possibilities of re-cycling. Although there are separate roadside bins for dumping plastic, tin cans and paper, most often we don’t separate our trash and just dump it together. There are also phone numbers one can call to take away heavy waste like furniture, but it is not uncommon to see sofas, dining tables and beds lying by the giant garbage bins by the sidewalk. In a report published by Time Out Dubai in 2011, WWF Living Planet ranked the UAE as having the third-biggest ecological footprint per capita in the world, after Qatar and Kuwait. The report said most of Dubai’s waste ends up in landfill. 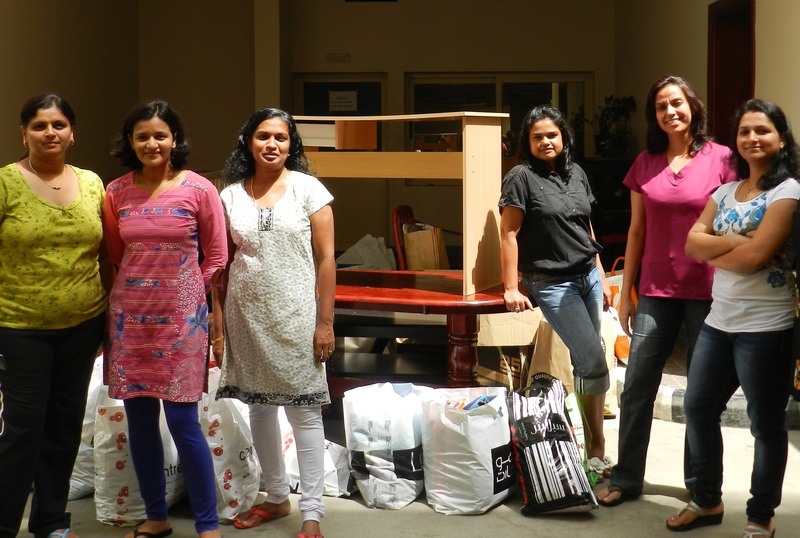 With this data in mind and after witnessing all the re-usable junk landing up in our apartment garbage room on a daily basis, three of us – Harsha Lulla, Jigna Bhatt and myself, Amrita Mukherjee – got together to create junk that would make a difference. To introduce ourselves all I can say is three of us have one thing in common – we have all swapped our successful 9-6 jobs for a more rigorous 24×7 position of being full-time moms and we all want to use the little time we get away from our mamma duties, in a constructive manner. 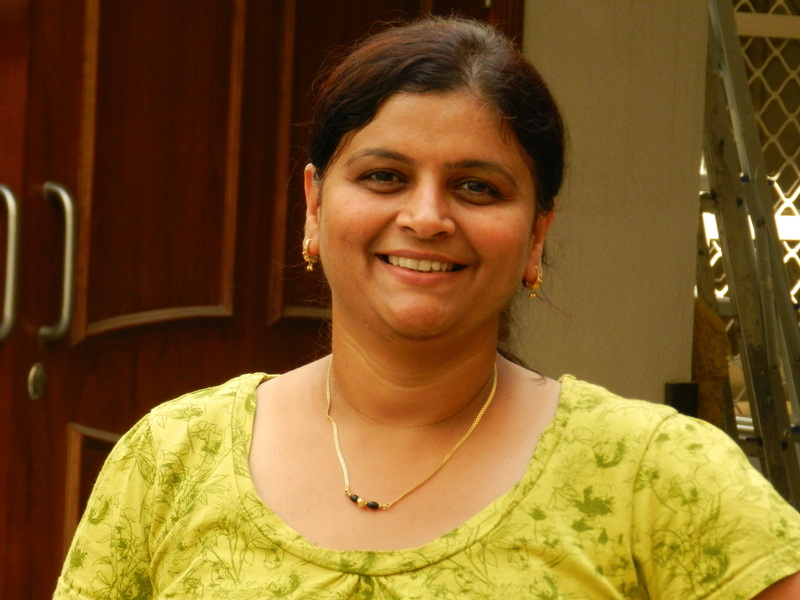 Harsha was working as a production manager for 16 years in a jewellery manufacturing and exports firm handling a team of 200 workers while Jigna has been a junior scientist, a college lecturer and a life science teacher and I have been a journalist. 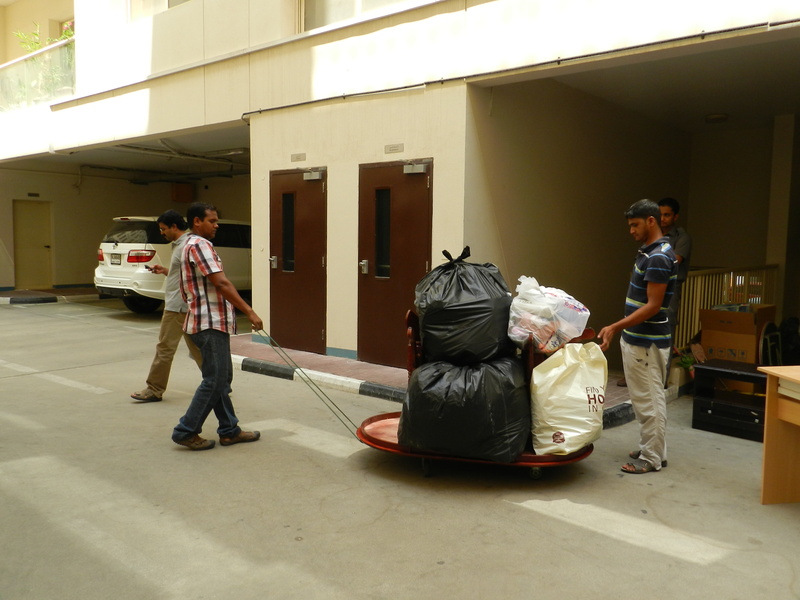 So organizing a JUNK DAY in our apartment building in Karama, Dubai, wasn’t too difficult a task considering our experiences in planning and management. What is a JUNK DAY? I had got this idea of organizing a JUNK DAY after I read the interview of Faisal Khan in Friday magazine published by Gulf News. Canadian-Indian Faisal junked his real estate business to do something that would make a difference to the community, keep the environment clean and earn him a living too. He started the organization Take MY Junk UAE, that not only saves furniture, home appliances and electronic goods, from landing up in the landfill they also give away clothes, books and other re-usable things to labourers for free. Faisal’s idea of a JUNK DAY: Residents of an apartment building coming together and putting their junk in one place for them to pick up. STEP 1: After we decided on a date to organize the JUNK DAY in our apartment we ran the idea by an enthusiastic supporter, our watchman Belal Hussain. Belal very pertinently advised us to keep the JUNK DAY on a Saturday instead of Friday when many families are on a day-out or stir out of bed late. We decided on Saturday, September 22. Then we posted A4 fliers near the lifts on the ground floor and in the basement. Over prompt email Take My Junk UAE confirmed pick-up at noon on that day. STEP2: After a couple of days when we were sure that all residents had gone through the fliers we visited each and every home in our building – that has 92 apartments – urging them personally to join the JUNK DAY. Of course, we divided the task between the three of us. The response was overwhelming. Almost all residents said they would join barring just a few who had given away all their junk to charities during Ramadan and pre-summer holiday cleaning. But many of them said they would still search their cupboards for something to bring along on JUNK DAY. STEP 3: Two days prior to JUNK DAY three of us met to look at the homes we had covered, people we still needed to get in touch with and if anybody mentioned any heavy furniture that needed dismantling. Overall we were happy with the response. 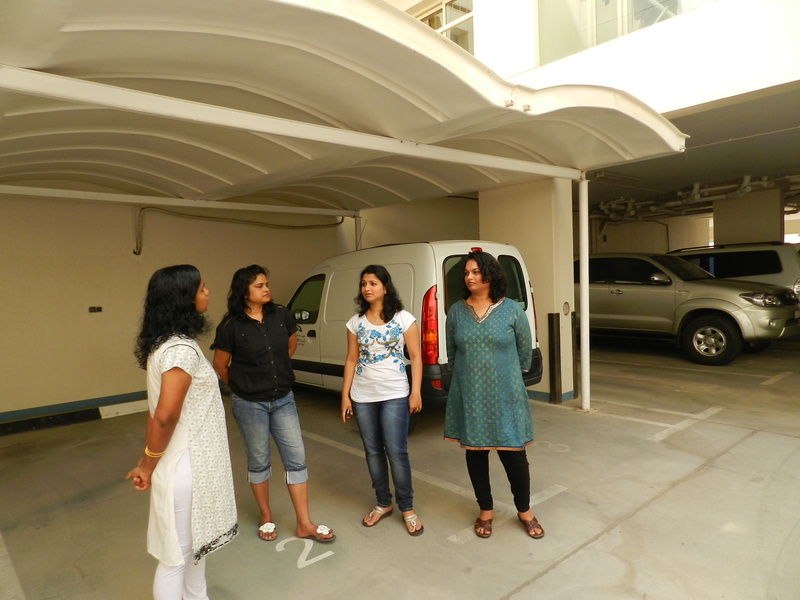 I was finishing feeding my son his breakfast when Harsha called to say she was rushing back from the gym and would meet me at our stipulated point at the ground floor garage. I could feel my heart beating a trifle quickly. The question on my mind was, “Would there be enough goods for the Take My Junk truck to fill up?” I still wasn’t sure. But as the lift opened I was greeted by a beaming Belal. “People have been keeping the stuff here from 7 am in the morning although you kept the time between 11am and noon,” he informed us. 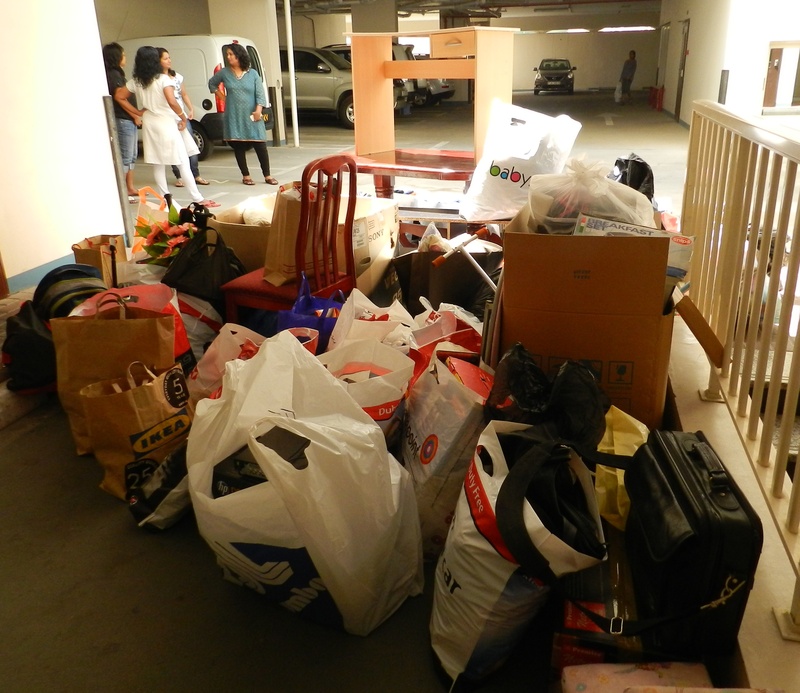 Our junk collection point was already over pouring with huge plastic bags full of clothes, shoes, books, stationery. I could spot an odd laptop, a children’s scooter, a wooden dining table, a computer table, a TV table, kitchen appliances and utensils, in the heap. I have never been so happy to see so much junk. As Harsha and I stood there meeting residents we made new friends among our neighbours, some of whom I had never met before, despite living in the same building for nearly two years. Some children came forward to help their parents place the junk, some got down to a game of football, while we chatted and enjoyed the bonhomie. The friendly Take My Junk UAE team arrived on the dot and put all the junk together in huge black plastic bags. And yes, their truck did fill up. Check out our photographs below. It did not take us a lot of time and legwork to reduce our ecological footprint and make a difference in someone else’s life. It just needed someone to take the initiative. Thanks to JUNK DAY we also got to know we have generous and enthusiastic neighbours. Last but not the least, while standing there and interacting with our building-mates we also lost some calories, piled on some vitamin D and reduced the stress hormones by sharing a laugh. What happened to our junk? Take My Junk UAE answers my questions. Where do the clothes, shoes, toys, books and stationary usually go? 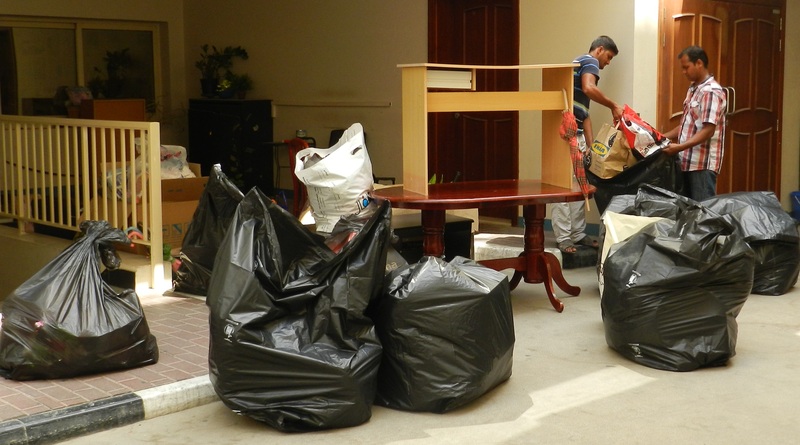 Take My Junk collects the unwanted items and then refurbishes them and sells them or redistributes them for free to labourers, maids or low-income families in Ajman and Sharjah. 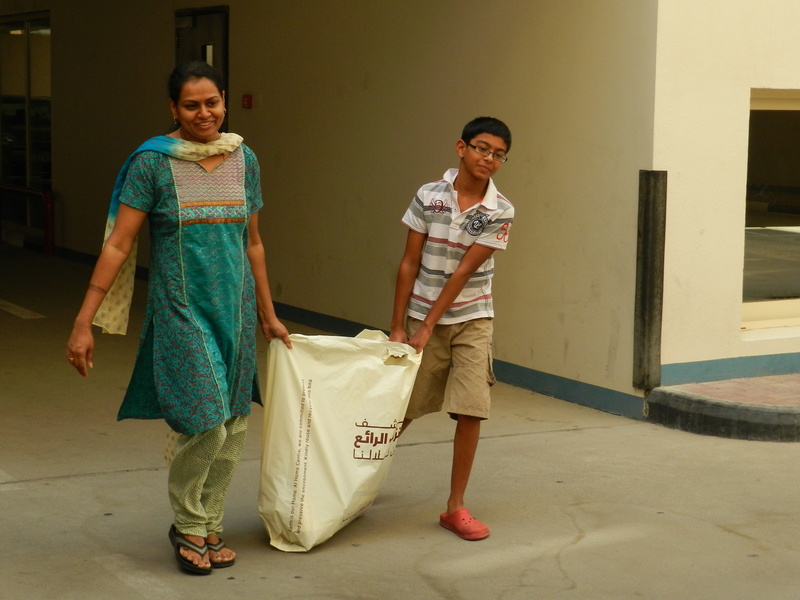 We try to provide quality goods to families that cannot otherwise afford to purchase new items. How does a junk day in an apartment building help you? A JUNK DAY in an apartment building helps us greatly as it saves us the cost, time and effort which would otherwise be wasted in collecting junk from each household. By selling or gifting your unwanted items to Take My Junk, you are not only helping those in need but you are also making a positive impact to the environment. 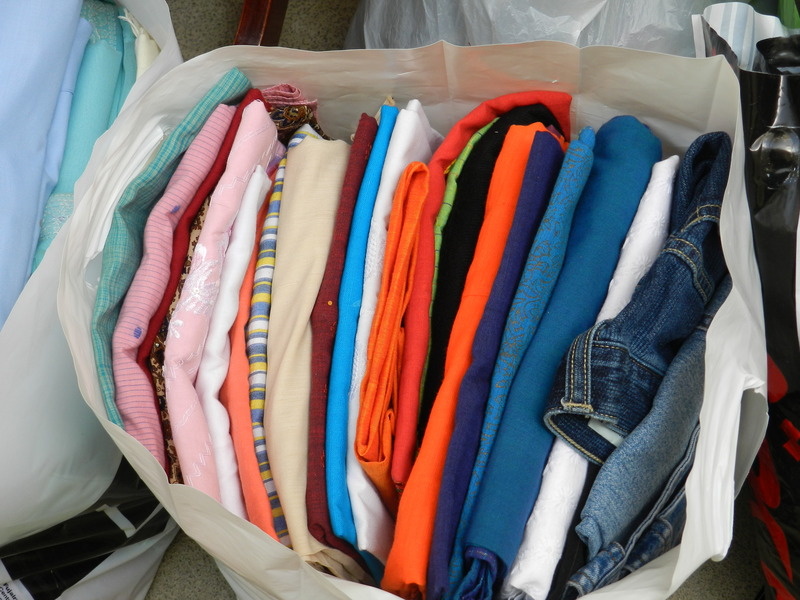 Because Take My Junk ensures items are RE-USED, these items are prevented from ending up in landfills. We also RECYCLE items that cannot be re-used. Through this combination of recycling and re-use, we are helping to conserve our precious natural resources for generations to come. What do you do with the sale proceeds? After expenses, Take My Junk donates a share of the revenue generated to Ajman Medical Clinic. The clinic has a Medical Fund that provides for many labourers who need medical attention. The “Take My Junk fund” provides a free voucher to men, who cannot afford to pay for a medical consultation. Can you give us a couple of examples of how junk collected by you helped somebody recently? How can we help you more? Firstly, Take My Junk UAE thanks you and your neighbourhood for organising the JUNK DAY and contributing items for the poorer sections of our society. Hope you can organize more such days in future. You can help us immensely by spreading the awareness of our services, by passing the word on to your relatives and friends, so they can call us when they want to dispose and discard any of their unwanted items. Take My Junk UAE believes and runs the business by the philosophy of “One Man’s Junk is Another Man’s Treasure”. We would like more and more people to join us and help us recycle and re-use and help us make our very own contribution towards a greener environment. We also encourage volunteers to come and help us sort the junk in our warehouse in Ajman. There is always a pile of junk that needs sorting or heaps of stuff to be distributed. Please email us at info@takemyjunkuae or call us on + 971 50 179 4045 to schedule community service days. We are planning a pre-Diwali JUNK DAY on public demand (more precisely neighbourly demand!!). 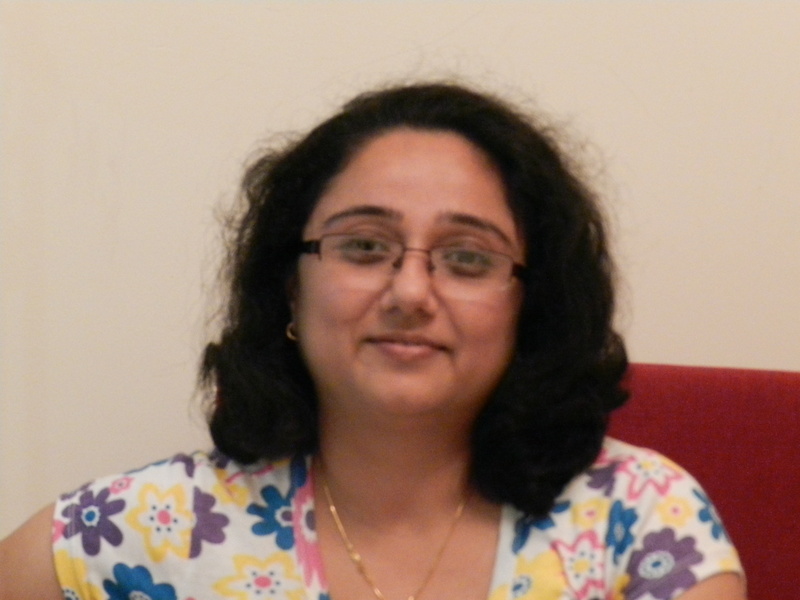 a big thumbs up to Amrita and your co-creators. may your initiative be the spark to ignite a million more minds to action. Thanks Chawm for your comment. Wow, marvelous weblog structure! How lengthy have you been blogging for? you made blogging glance easy. The entire glance of your web site is magnificent, let alone the content! Thank you. Your comment is much appreciated. Very great post. I simply stumbled upon your blog and wanted to mention that I’ve truly enjoyed surfing around your blog posts. After all I will be subscribing in your feed and I’m hoping you write again soon! I am glad you liked my blog. Thank you. Hi there, I found your web site by way of Google whilst searching for a comparable topic, your web site got here up, it appears to be like great. I’ve added to favourites|added to bookmarks.